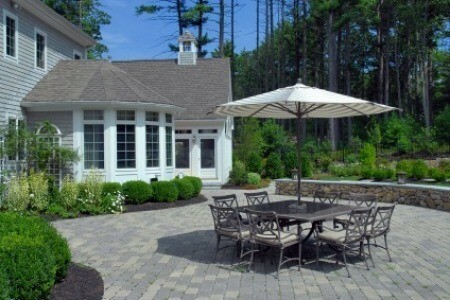 Patios are becoming essential elements for todays backyards. Here are some design tips for creating the perfect outdoor space to use for summer dining and entertaining. When choosing a location for your patio, its wise to consider several factors. Among the most important of them is how you will be using the space. Most patios are located as close to the house as possible and are used as an outdoor extension of indoor space. This makes the patio convenient to power sources for lights and other equipment necessary for entertaining. Exposure - Another factor to consider is exposure to sun and wind. A warm, sheltered patio will offer you use both earlier and later in the season. If your desired site is exposed to wind, you can provide shelter (and privacy) by planting tall shrubs around the edges of your patio, or erecting trellises or panels made of lattice and covering them with quick-growing vines. A pergola roof will help screen out too much sun, but think twice before locating your patio under large trees. Not only will they cast a lot of shade, but trees continue to drip long after it rains, falling leaves are messy, and the roots may eventually heave and dislodge paved surfaces. Determining size - The size of your patio should be in proportion to the rest of your landscapetoo small and it may look trivial; too large it will overpower the entire yard. A general rule is to allow approximately 3 x 3 feet per person, plus any additional space needed for a barbeque, potted plants, extra furniture, a fireplace, water feature, etc. When choosing a surface material, consider wear and tear and whether or a material will be slippery when its wet. The choices for materials are nearly endless and include such things as concrete, natural stone, tiles, bricks and pavers, composite decking and wooden planks. Concrete and stone pavers tend have an edge in terms of durability and maintenance, but they are more difficult to install and have a greater up-front cost than wood. Simple is best - Use restraint when selecting surface materials for the patio. A single, natural colorperhaps with one or two accent colorswill look best. Too many colors may end up looking busy and distracting. Also keep in mind that artificially-colored pavers may weather and fade over time. Smother weeds - If you decide to use wooden planks as your surface material, install a permeable landscape fabric underneath them first. This will offer additional protection against weeds, but without trapping moisture against the planks. Grade for drainage - Make sure the grade of the patio slopes away from the house so that water can drain freely. A gradual slope of 1 inch for every 6 feet is usually sufficient. Plant vertical layers - For the floor level, use containers and flower boxes. At eye level, use hanging baskets or pots set on tables. For additional height, train vines and climbing plants up a trellis or wall. Keep walkways clear - Keep container plants out of high-traffic areas and away from doors and other access points where they may be tripped on or knocked over. Minimize maintenance - Keep messy trees and shrubs as far away from your patio as possible. Certain fruits trees, like cherry, mulberry, and crabapple, can leave permanent stains on fabrics and hard surfaces when blossoms and fruits fall. Large trees can deposit needles and seed pods that constantly need to be swept up.